The Macrobiotic diet contains whole grains, beans and bean products, organic vegetables, soups, sea vegetables, oils, desserts, fish, fruit, pickles, condiments, nuts & seeds, filtered pure water, and non-aromatic teas. Macrobiotic comes from "macro" which means big, and "bios" which means "life". Macrobiotics is a lifestyle like the other diets reviewed. It is based on Chinese medicine that conforms to their eastern philosophies and religious practices. 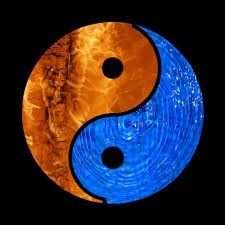 The balance of all energies in food is the concept of the yin & yang. Michio Kushi introduced the diet to Americans in 1950 and later established the Kushi Institute in Becket, Massachusetts. 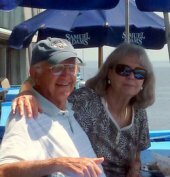 Barbara and I attended a week long program in 2013. I was fascinated by the fact that this diet was mostly composed of cooked foods and still had fabulous disease reversals. The food and instructions were wonderful. Unfortunately the Kushi Institute has recently closed its doors. 1. 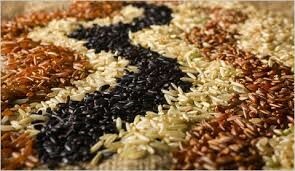 Grains - Grains are the foundation of the macrobiotic diet meals. They should make up 40-60% of your meal. Whole grain brown and wild rice, barley, millet, whole wheat, etc. 2. Vegetables - The major portions should be cooked with a minor portion in salads or raw. Cooked and raw vegetables should make up at least 20-30% of the daily meal. Most greens are acceptable. Spinach should be limited. Try to use local and in season vegetables if available. It will take a little practice to follow the yin/yang value of veggies and understand when to use them. 3. Beans - Beans, especially fermented bean products like tempeh and miso are important to your meal. Beans should be about 10% of your meal. Tempeh, whole beans or legumes like lentils, chickpeas and more should be on your plate. Tofu is also a good choice as it contains natural probiotics and aids digestion. 4. Soup - Soups are a very important part of a well-balanced macrobiotic diet and should be eaten daily. Soups that contain grains, veggies, sea veggies and beans are an ideal macro meal in a bowl. Miso soups are pretty popular. 5. Fermented Foods - Tempeh is ideal but you can also try pickled vegetables which bring lots of good probiotics in your diet. 6. Sea Vegetables - Dulse, kelp, Kombu, arame and many others are available. Sea veggies are rich in vitamins and minerals that are lacking in most foods today. 7. Oils & Condiments - Non-GMO oils like sesame oil and corn oil are the best. Miso, sea salt, brown rice vinegar, gomashio, shoyu, tamari, tahini, brown rice syrup, vegetable broth, dried mushrooms and others play a major part in preparing a tasty meal. 8. Fish - The macrobiotic diet allows while meat fish 1-3 times a week. If you are vegan or vegetarian you can omit the fish. It will not affect the success of the diet. 9. Fruit - Fruit should rarely be eaten with a macro diet. The fruit is okay for snacks or desserts but should not be eaten more than 3 times a week. Tropical foods, like bananas or pineapple, should be limited or avoided, unless you live in a tropical zone. 10. Whole Foods - The less processed foods are, the better. This is one of the most important principles in the macro diet. 11. Sweets - The first choice for a sweet taste is whole grains and vegetables - sweet vegetable jams and broths, and grain based sweeteners such as barley malt or rice syrup, and apple juice. 12. Snacks - Left overs, seeds, corn of the cob, rice balls, mochi, rice cakes, popcorn, cookies, crackers, chips, muffins and others. 12. Beverages - Roasted barley or brown rice tea, Bancha or twig tea, filtered water, Green tea, beer, whiskey, sale, and soy milk can be used infrequently if desired. The following foods to be avoided if you live in a 4 season climate: meats, animal fat, eggs, poultry, dairy products, refined sugars, chocolate, molasses, honey and all foods processed with simple sugars, and vanilla. Limited us of the following: tropical or semi-tropical fruits and fruit juices, soda, artificial drinks, coffee, colored tea, black tea, green tea, all aromatic stimulating foods, artificial soy sauce & vinegar. The energies of foods in the macrobiotic diet are classified as either "yin" or "yang". The idea is to balance between the two. Yin food is cool and expanding. Yang food is warm and contracting. Foods that are condensed and grow below the ground such as burdock, carrot and other root vegetables are more yang. Those that grow on the ground such as onion and squash are more balanced while those that grow above the ground are yin. Meat, dairy, poultry, cheese, refined sugars would be considered extreme "yang." Extreme "yin" foods would be processed foods, most sweeteners, dairy foods, stimulants, tripical foods, some chemicals, drugs, and seasonings. It is difficult to find good macrobiotic meal plans and recipes on the web. I found a great recipe website sponsored by EDEN FOODS. 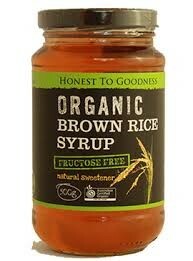 They are, in my opinion, the finest organic food producers in the country. There are 946 macrobiotic diet recipes that have detained nutritional information. If you decide to follow this diet plan, it would be helpful to find a macrobiotic chef or school that you can attend and learn firsthand how to prepare and plan meals. 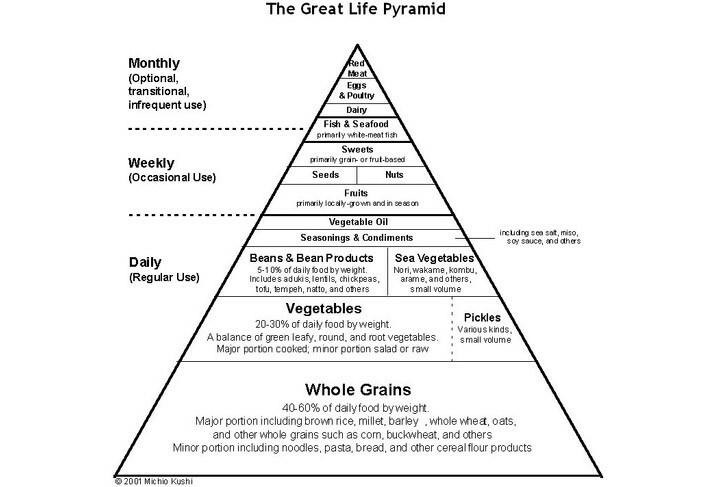 The Pyramid was designed by Michio Kushi to give Macrobiotic dietary guidelines for a temperate climate. The standard averages may be adjusted for climate and environment, cultural or ethnic heritage, gender, age, activity level, individual condition of health and personal needs ,and other considerations. Whole grains, vegetables and beans are the mainstay of this healthy diet with a philosophy of finding balance in life for health and vitality. The "Big Life" or Macrobiotic diet has reversed chronic diseases in many people that we have known, and has even reversed pancreatic cancer. This, in itself, gives credentials to this lifestyle. Fiber Rich Plant Based Diet - Chronic sickness and disease in our western culture is largely due to the effects of too little fiber in the diet. Building Your Immune System - Foods to boost your immune system are found in a healthy whole foods plant based diet. Best Water Purifier - For less than 2 cents a gallon, you can have pure water without the expense and hassle of buying water in plastic containers.